“O bydded i’r hen iaith barhau” (may the language endure for ever). Welsh has done well to endure in relation to English; despite the scare of the 2011 census, it’s still the most used of all the Celtic languages. How was that possible against the language of the empire on which the sun never set (though Herodotus first said this of Persia, not the ‘Brits’)? And in the Welsh case, the neighbouring army and navy have been a rather bigger for a rather long time. So how did the language survive? Of course the borders between languages are not always effectively policed. Structural linguist Leonard Bloomfield defined the term dialect continuum – shades of mutual intelligibility as one dialect merges into another – which social linguists extended to a language continuum. While the rise of the centralised nation state has meant the fall of this linguistic continuum, the lines are not clear cut yet, as this image shows: It’s one of the Basque ‘Mutur Zikin’’s glorious linguistic maps. Yet Welsh is clearly not mutually intelligible with English. Google seems to agree with Max Weinreich; if a new language gets added to the 90 available on Google Translate, it has to have a force behind it. A “strong candidate” i.e. “a language and not a dialect”, has a heavy online presence: “it’s actively used on the web together with translations into other languages (news articles, multilingual websites, books, government pages and so on)”, and there is an army of speakers “eager to partner with us and offer their language expertise.” In fact, if you have any issues with Google Translate (and who doesn’t?) you can join the expert task force and correct their existing translations here. So maybe that’s how Welsh made it; not by imperial might, but the guerrilla tactics of committed language activists. 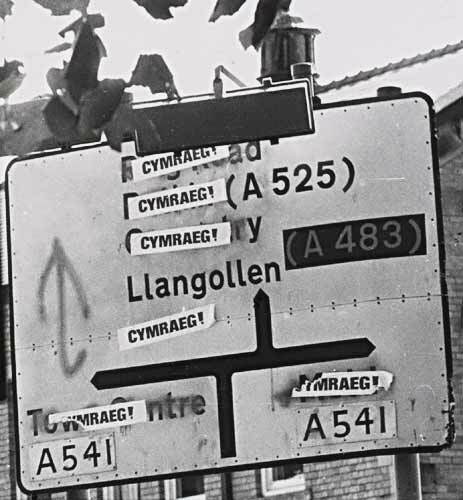 The Cymdeithas yr Iaith Gymraeg (Welsh Language Society) took non-violent direct action in the 1960s, refusing to pay bills that were sent only in English, altering road signs to protest at the lack of translation into Welsh (Cymraeg! ), and committing to “do everything in Welsh” until the law and society changed.